Out on the Internet you can find many lists of the top apocalyptic movies of all times. The recent Netflix film in this genre, “How it Ends,” recounts a mysterious science fiction apocalypse, but it leaves the ending dangling with an unfulfilling and ambiguous secular vision of the end of days. During the Cold War era, end-of-time movies centered around global conflicts and inevitable battles. Sometimes this took on a quirky, comical form, as in the classic 1964 film starring Peter Sellers and George C. Scott, “Dr. Strangelove Or How I Learned to Stop Worrying and Love the Bomb.” In that film one insane general activates a path to the nuclear destruction of the world and a host of politicians and generals try to avert it. We Jews have produced our own serious classic stories over the centuries of apocalypses and end-times. For instance, in the book of Ezekiel we are told of the future conflict — how Gog of the land of Magog and his multitudes will threaten the restored kingdom of Israel. Ultimately, the prophet assures us that the enemies will be destroyed, and God will establish a new Temple and dwell among his people in a time of lasting peace. Now — coming back to your question. You want me to calculate the end date of the world for you, correct? Let me tell you that even if I could do that (and I cannot), and even if it was coming up real soon, and even if you sold all of your possessions or made other serious plans for the end of times, that still might be disappointing to you. The predicted day and hour could come, and the world still could continue on as usual. And then what? You would think that then you ought to forsake your anxiety-ridden anticipation of the finality of things and come back down to Earth and resume some ordinary form of day-to-day existence. But social scientists have studied millennialists and other messianic cults and found that when those who predict a specific end-time reach that hour and nothing changes, they may simply declare that a calculation error was made and readjust their ultimate expectations to an alternate date. The leaders of the Bo and Peep sect, known also as Heaven’s Gate, for example, went on for years making predictions to their followers of end-times, resurrections, and heavenly ascent. When each phase passed and no salvation ensued, they did not disband and go back to their towns. They recalculated and continued their frenetic cultic anticipations. Finally, after more than two decades of activities, in March 1997 police discovered the bodies of 39 members of the Heaven’s Gate sect. They had participated in a mass suicide — believing this was their way to reach the salvation of an extraterrestrial spacecraft following the Comet Hale–Bopp. This extreme example shows the terrifying power of the apocalyptic imagination of end-times and redemption. Given numerous such past examples, I’m worried about anyone who asks about and calculates and believes in the imminent end of days. Because when the expected outcome does not materialize, the seekers of salvation may choose a sad and tragic ending of their own making. The messianic followers of Jim Jones, for instance, committed mass suicide in 1978 in Jonestown in Guyana. As you may recall, more than 900 members of the Peoples Temple died by drinking a powdered Kool-Aid mix laced with cyanide. In our history we have our dramatic sectarian episodes of false messiahs, like the Turkish Sephardic rabbi-Kabbalist Shabbetai Tzvi, who proclaimed himself as our messiah in 1648, but ultimately died in controversy in 1676 after apparently converting to Islam. In his heyday many Jews believed he was the authentic messiah. But as we know, his activities did not result in the salvation of the world. Among the classic Jewish predictors of end-times we have our prophets, who mostly are more moderate messianists, predicting not an abrupt end to time but a new era where impressive transformations of human conditions make all of living better. “And it shall come to pass in the end of days, that the mountain of the Lord’s house shall be established as the top of the mountains and shall be exalted above the hills; and all nations shall flow unto it. to the house of the God of Jacob; And He will teach us of His ways, and we will walk in His paths.’ For out of Zion shall go forth the law, And the word of the Lord from Jerusalem. This vision has such universal overtones that you can see it inscribed on a wall outside of the United Nations building in Manhattan. A more complete picture of our messianic visions also includes our dramatic extra-biblical belief in the resurrection of the dead. This always has been a difficult notion for me to visualize (even after I saw Michael Jackson’s music video “Thriller” in 1982). Hence, unlike our apocalyptic visions of the end-times, our more moderate messianic hope in a better age — not calculated with that much precision and not describing violent upheavals — gives people solace in times of distress. Bottom line. I’m not big on prognostications. I believe we need to live for today and plan carefully for tomorrow. Live then as a good citizen. Take good care of yourself. And try to make your worries less global and terrifying. So, to help you tune in to the needs of immediate life and put away your ominous trepidations and ruminations on the end of the world, I offer you this closing thought. Remember that your quarterly New Jersey home property taxes are due today, February 1. Pay them on time, and then prepare to pay them again for the next quarter on May 1. I’m confident enough to say that you won’t find the world ending before the next payment is due, and you should plan your life accordingly. 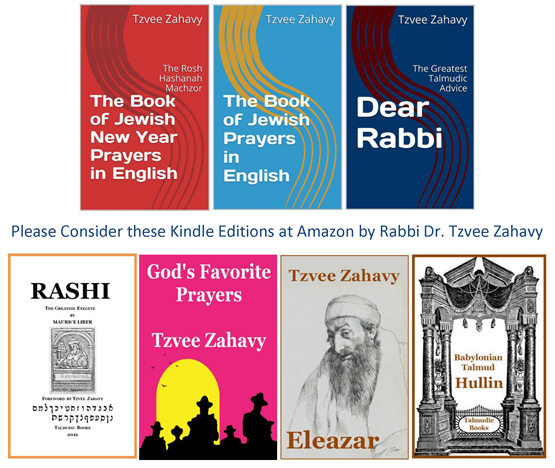 Tzvee Zahavy of Teaneck is a prolific author who has published many books and articles about Judaism and Jewish law. Tzvee has served as professor of world religions, Talmud, Jewish law codes, Jewish liturgy, Jewish history, Near Eastern and Jewish studies at major U.S. research universities and seminaries. He received his Ph.D. from Brown University and his rabbinic ordination from Yeshiva University. See his web site www.tzvee.com for more details.